It was two years ago today that VelocityShares launched their six VIX-based exchange-traded products and I’m fairly certain I was the only one who was covering that event on the day of the launch: Impressive Launch for Sextet of New Volatility ETNs from VelocityShares. Two years later, one of these products, the VelocityShares Daily Inverse VIX Short-Term ETN, (XIV), is an unqualified success in terms of assets and performance. Over the last three months, XIV has traded an average of more than 12 million shares per day, making it the second most popular VIX-based ETP, after VXX. Part of the reason for XIV’s popularity is no doubt due to performance. As the chart below shows, XIV is up more than 200% for 2012 and has been the top performer across all ETPs for the year. As meteoric as the rise of XIV has been, what surprises me is how little attention XIV’s sibling, ZIV, (VelocityShares Daily Inverse VIX Medium-Term ETN) has received. ZIV typically trades about 10,000 shares per day and yet this ETP has outperformed XIV by a substantial margin since the two were launched. Not only has ZIV been a better performer, but it has done so with considerably less risk. 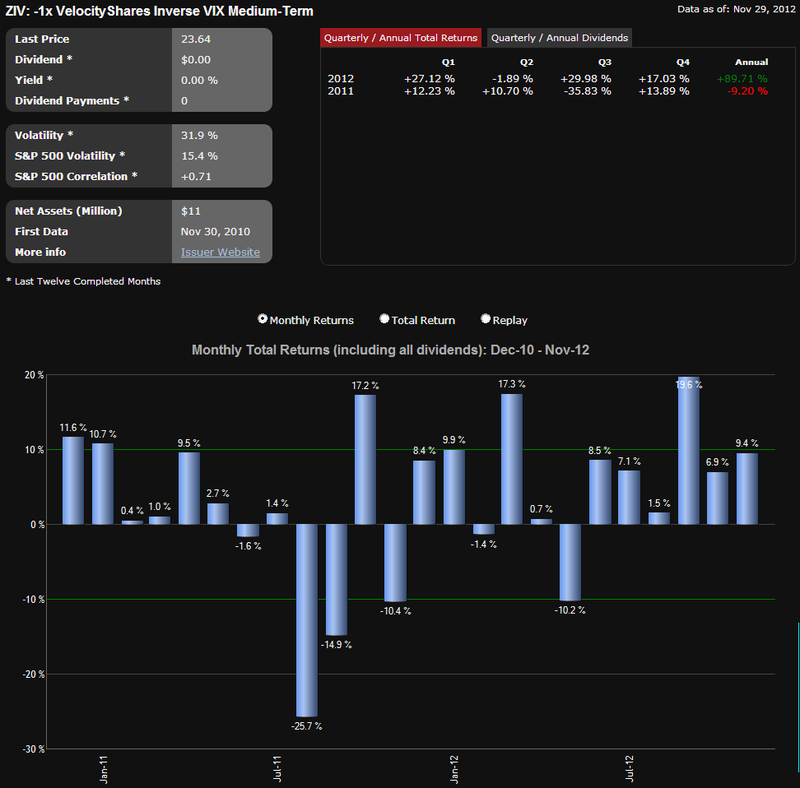 In 2011, for instance, XIV was down 45.54% for the year, while ZIV incurred a loss of only 9.20%. I thought perhaps that my ZIV Undeservedly Neglected post from January of this year might jump-start some interest in ZIV, but for some reason, investors continue to shy away from this impressive performer. 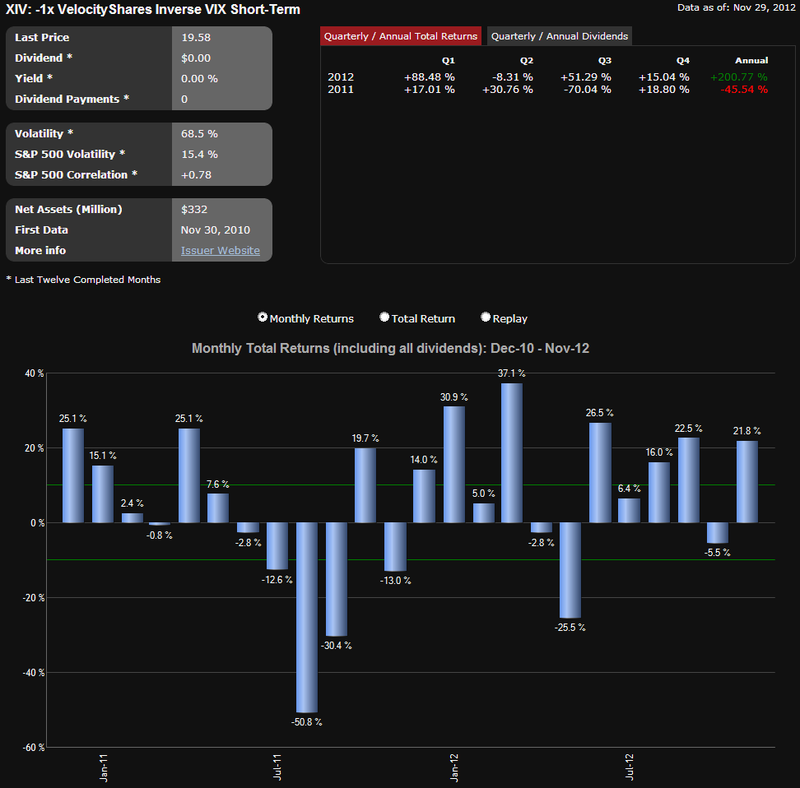 The other four products that VelocityShares launched with XIV and ZIV have had mixed results. 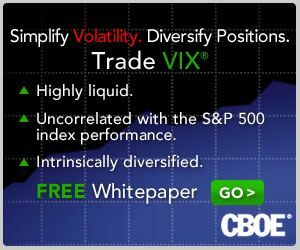 The most famous of these is TVIX, which was briefly the top VIX-based ETP in terms of volume in February, before Credit Suisse (CS) suspended creation units in the product, which opened the door to the ProShares Ultra VIX Short-Term Futures ETF (UVXY) displacing TVIX as the top +2x VIX-based ETP. For the most part, VIIX, VIIZ and TVIZ have operated as niche products since their launch. Going forward, don’t be too surprised if XIV and ZIV continue to post impressive numbers and if you haven’t yet looked at ZIV, it is never too late to do so. How High Might the VIX Spike?